Fidelity Express, a full-service financial services company, wanted to promote their growing awareness of environmentally friendly practices. They were looking for eco-friendly giveaway items to hand out at tradeshows, appreciation events and other annual gatherings. Proforma presented the client with many green options including an eco-pen, a Zippy Corn letter opener and padfolio. The eco-pen was a great value and could help promote their green message to a large audience, while the corn letter-opener would be a daily reminder of Fidelity's commitment to conserving resources. 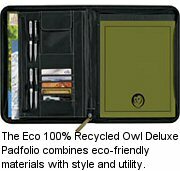 The client was especially excited that the padfolio was made from recycled product with 100% post-consumer recycled paper, which was an important distinction for them. The client was so impressed, that they choose all of the products for their annual events. Proforma didn't stop there, but continued to make every effort to lessen the carbon footprint of the promotions. Proforma gave special consideration to freight methods and asked that the item shipped from the closest factory. Fidelity Express was pleased with the entire promotion and the example Proforma set by choosing eco-friendly practices in its everyday routine. Use more eco-friendly methods to promote your company and brand. Contact us today.